This All Purpose 200 ft. Rope has a solid braid construction which enables it to retain its firm, round shape under stress. Originally designed for windows, but is popular for use as a utility rope. This All Purpose White Clothesline is constructed of a rugged braided jacket over a durable core. Because of its cotton/poly blend, it is flexible, easy to handle and holds knots extremely well. Cordzilla Bungee Cord. Hollow braided polypropylene rope with rubber elastic core. Abrasion, rot and mildew resistant jacket. Vinyl coated steel.hook with safety clip. Adjustable foam pads protect surfaces from scratching. 5 ft, 400 LB Load Limit. Excellent abrasion resistance and handling characteristics. Can withstand dynamic loads. Strong and durable. Mildew and chemical resistant. Great for hauling, lifting and towing. White. Knots and handles easily. Rot and mildew resistant. Floats. Vibrant colors increase daytime visibility. Great for outdoor recreation and general purpose use. Natural fiber diamond braided cotton. Great for indoor use. This clothesline is designed for customers who demand superior quality. The solid braid construction enables it to retain its firm, round shape under stress. Also good for window sash cord and utility rope. 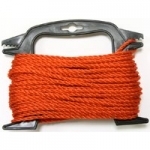 This solid braid nylon rope is strong, flexible, knots easily, and it is chemical resistant. Excellent shock absorption. Knots and handles well. Excellent general purpose rope. Mildew and chemical resistant. Great for hauling, lifting and towing. White.